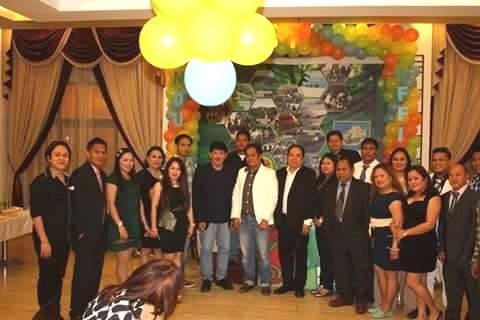 TAGBILARAN CITY, MARCH 29, (PIA) – For the love of Bohol, Boholanos in Kuwait engaged non Boholanos even, to organize Tigum Bol-anon sa Tibuok Kalibutan (TBTK-Kuwait) and join the help earthquake and calamity stricken Bohol bandwagon. It would also be a help-group for Boholanos in Kuwait who would be needing such, organize support for help Bohol and promote the province as an investment haven and tourism destination. It’s basically a Boholano group, the first in Kuwait which is recognized by the embassy, Argie Mortejo described the group. We are into seeking ways to help Bohol rise up from calamities as well as promote the province’s tourism destinations and a perfect place for families of Filipinos working in Kuwait to visit, as they come home. The group is also preparing to join the TBTK in Bohol this July, she added. TBTK is a quadrennial gathering of Boholanos from all over the world in Bohol, initially aimed at engaging Boholano expats to be balikbayans and possibly see ways to invest their hard earned money for development in Bohol. No less than Philippine Consul General to Kuwait Atty Raul Dado who inducted the newly organized TBTK-Kuwait, at the Kuwait Continental Hotel, March 27, 2015. she said. Also with the consul general was Labor Attache Atty Cesar Chavez. Elected officers are: President Engr. Jim A. Dalugdog, Vice President Jose E. Simangca, Vice President for Operation Leah M. Francisco, secretary General Heraclea V. Jayectin and Assistant secretary Argie Mortejo. Key officers also elected are Secretary for personnel Glenda L Bauab, Secretary for Appointments Noli I. Maputol, Secretary for Operations Gamaliel Jayectin, Secretary for Finance Maria Eva Tiongco, Assistant Treasurer Samson Dumangas, Audit Secretary Ma. Leah Parilla. TBTK Kuwait Secretary of Justice is Quirino Tumampos Jr., Relations Secretary Rodel Lovette, Projects Secretary Albert Edulan and Willy Vismanos, Transportaion Secretary Floro Navea, Gil Franciso Rufin Jr and Jimmy Mendoza. Alos elected are Coordination Secretary Marcial Usaraga as Sheba Virginia Gison and Conrada Pondoc are advisers. 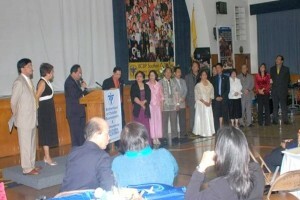 The first-of-its-kind BCBP USA Grand Gathering on October 10, 2009, saw the installation of BCBP Southern California (SoCal) Outreach as a Chapter, the first ever outside Philippine shores. As the 65th chapter of BCBP, BCBP SoCal Governance Team is composed of the following: Chapter Head, Dito de la Cerna; Mission Director, Rusty Carluen; Formation Director, Lib Madamba; Program and Services Director, Polet Tiano; Unit Heads, Boholano couple Hermes and Yonnie Quijada and Carlos Gorospe; Treasurer, Ed Obra; West Covina Mission Team Head, Edwin Dimaculangan. The whole day event, held at Mary, Star of the Sea Parish Auditorium in San Pedro, California, kicked off with a Grand Breakfast, which was attended by more than two hundred guests and members. The guest couple sharers were Larry Veloso, BCBP National President and his wife Dedit. A two-part retreat conducted by Father Herbert Schneider for BCBP Southern California and Northern California members followed thereafter. Then, a Holy Mass was held at 5PM prior to the installation rites proclaiming BCBP SoCal Outreach as a Chapter. BCBP President Larry Veloso gave the opening message during the Chapter Installation. Bro Manny Jimenez, Area Managing Director – South Luzon announced the official appointments with Jun Obra, RCD – South Manila, handing over the appointment letters to each governance team member. Fr Schneider then prayed over the new Governance Team. The installation was witnessed by members and guests from the US and the Philippines headed by Bro Louie and Sis Lilli Morales, BCBP Alabang. Hermes Quijada and wife, the former Leonarda ”Yonie” Bontog are graduates of the BCBP-Tagbilaran sponsored Christian Life Program (CLP) 3 in 1993 and are active members of the BCBP community since then. Bro. Hermes hails from Mariveles,Dauis Bohol and was Auditor of the Norkis Group of Companies. He used to hold office in the company owned building along CPG Avenue corner Ma.Clara Street. Whereas Yonie, who was born in Carmen,Bohol, is a Chemical Engineer by profession and was a Math and Science teacher of the former Central Visayas State College of Agriculture, Forestry and Technology(CVSCAFT), now Bohol Island State University in Tagbilaran City. She currently is teaching Chemistry at the Dominguez High School in Compton, California. They have two children, .Jannie Vince, 18, a college student and Dan, 16 ,a High School juniors. The Quijada family migrated to the United States in April,2004. Other Boholano members of the BCBP SoCal are : former Loay Vice-Mayor Nandie Maniwan and wife Gela, Lorrie Matig-a, and Sylvia Fortich . for every dream precedes a goal. We thank the Bohol News Daily(BND), thru Jerome Auza and Fides Maria Vistal, for providing us space in their publication, to reach out to our Boholano brothers and sisters at home, in the Philippines and wherever they are station in the world. For they are our intended target in our campaign promotion that is starting in earnest, in preparation for TBTK 2012, which is three years from now. Through this online web, we wish to communicate and get in touch with our people. Giving them updated news and development on a weekly basis about TBTK, the Boholano associations in America and elsewhere abroad, the personalities involve, highlighting their stories thru the BND. We believe our stories are also of the readers’ interest. Just as we, the Boholanos on overseas assignments, are interested too of current news and developments in our home province. As they say, in whatever human endeavor, communication is the key that will bring the proponent to the realization of their aspired goals. In our travel through the United States, we were once able to set foot on a well-appointed office, in a skyscraper located along Chicago’s suburb. What met our eyes as we passed through the entrance door is the sight of a mounted, colored picture that bears this marking: “Communication is the key to success, pass it on. As the appointed Communications Director, this writer is given the task by the TBTK Chairperson Betty Veloso-Garcia, to start spreading the news. The load may not be easy and the burden may not be light, but we will carry this task until D-day to show our love and affection for Bohol and our fellow Boholanos. Yes, the success of a grand undertaking as the TBTK, depends on our ability to disseminate information the soonest time possible. We count on you, our dear readers, our Boholano friends and supporters, to rally round our fold that hopefully we can be homeward bound, see each other in Bohol, in the month of July, 2012. Replicate the success of the previous TBTK staging. God willing. What more, we intend to come up with better plans, programs and action to bring out the best in the next Tigum. Together, we will make a difference in the lives of our people. Together, we will introduce new ideas, channel our resources and hard-earned money from our workplace abroad, and contribute our share for nation building, for the progress of our province. Together, we can make dreams come true by becoming role models for our children, our young students and professionals back home, who too desire to gain employment abroad and improve their stature in life for themselves and their families. Bohol is elevated from the ranks of the depressed to vastly improved. We are the leader among provincial ethnic groups in the country whose dollar remittances from our OCW-OFWs, keep our economy alive and vibrant. The Boholanos are now respected in the Philippines and our overseas workers admired in workplaces abroad. We are now everywhere, globally at that. From America, Canada, Europe, Australia, Asia, the Middle East and even in far-away Africa. The Boholano community’s influence transcends beyond national borders and stretches through the seven seas. This is one achievement that we Boholanos should be proud of. That the TBTK Global Gathering which we look forward to every three years, is an idea that speaks of our identity and unity as a people. The common bonding and love of Bohol. Confucius said that the journey thru a thousand miles begins with a single step. Let this write-up be the beginning of our interactions with the rest of the Boholanos wherever you may be situated. For us to have that common mission, vision, goal to look forward to for TBTK 2012. For queries and inquiries, get in touch with us thru our e-mail ad:douglashont@hotmail.com. Till the next issue. 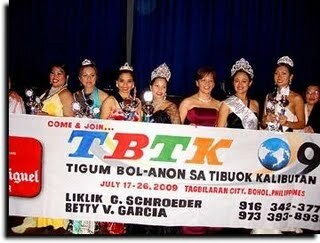 Despite all the threats: the A H1N1, the plummeting world economy, the mass lay-offs in workplaces abroad, still thousands of Boholanos abroad took all these lightly and packed for home last July 2009 to join the TBTK Global Homecoming. For them, it was real joy to spend their hard-earned dollars to be with their loved ones, to get involved in class reunions, to go to places to reminisce the good old days, and many more. TBTK Chairperson Betty Veloso Garcia did not count the cost of visiting Boholanos spread in various countries to remind them that their families they left behind are so excited to be with them no matter how briefly. Whether they registered or not was not so important as coming home to embrace an aged and ailing Nanay or Tatay – perhaps for the last time. What everyone observed in the two-week TBTK celebration spoke of the pomp, pageantry, revelry in every social function. The fund-raising each group organized for its various purposes was more than enough to bring Balikbayans together and experience the great satisfaction that they have left something to our fellow Boholanos who are in need. Even those who did nothing but roamed the streets felt that money was in circulation. Vendors in our markets enjoyed the opportunity of earning much, much more than they did in ordinary days. Not all may have noticed the tree planting, the medical missions, the recognition of Boholanos who excelled in their various professions, the organized tours to see what’s new in Bohol. But despite the beauty of the homecoming, those who simply folded their arms as they watched the activities unfold, they saw nothing but “faults”. Sometimes faults are there for a purpose – to satisfy those who come only to find faults. With the election days just a few months away, some politicians make adverse comments to enhance their political ambitions. These critics even found their way to our community newspapers, to radio stations. This they did “in aid of legislation” and also to improve the next TBTK. This was baloney! On the issue of public funds appropriated by the Provincial Government during the TBTK Medical Mission conducted at the Bohol Cultural Center, we deny that such funding was received by the TBTK. It would be best that they do some kind of research so that they can be sure where their money went. While we appreciate the Medical Staff assistance provided by the Provincial Government, nevertheless, we assumed the cost of operation of the medical mission funded from our own contributions. The medical men who came to Bohol to extend free medical assistance to the Boholanos, brought their own equipment, medicines, etc. Furthermore, they spent their own plane fare, hotel billeting, and cost of everything during their stay in Bohol. At this juncture, the TBTK organizers especially the Chairperson Betty Veloso Garcia would like to thank the many men and women who so generously gave of their time, effort and commitment towards making the TBTK a big success. We thank our many advertisers, benefactors and sponsors for their generosity, and their confidence and belief in this unique event. Last but not the least, to everyone who took part of this great reunion, we thank them for coming! Let us talk about the Search for the Miss Bohol International Beauty Pageant. This activity has always been among the highlights of the Global Homecoming since its inception in 1999. Like any other Beauty Pageant, they were never without a Swimsuit Competition. What was indecent in their attire? The Boholanos are now used to wearing appropriate attire for swimming except perhaps the octogenarians who wear the “porontong.” May we address this to the critics, “Why did you miss to see the appropriateness ( ? ) of the swimsuits worn in the Sandugo Beauty Pageant sponsored by the City Government? We call on our politicians not to meddle in future TBTK affairs. We just want to come home to where we belong. The City Mayor of Tagbilaran instead of welcoming us, he made things difficult for us : denied the TBTK with Mayor’s Permit for the venue of our activities, prohibited us from soliciting advertisements to promote the business of our local businessmen through our Souvenir Program. What a pity! Boholanos not welcome in their homeland. We also urge our Vice Governor Julius Herrera and Board Member Aster Piollo not to engage in political grandstanding at the expense of Boholanos whom people call “unsung heroes”. These politicians are seeking a new mandate in the 2010 elections and they should look at the TBTK as a group who come home to bring cheer and material benefits to our people. Let us instead help one another because we love Bohol. In 2012, God willing, we will be back for another homecoming under the same able leadership of Betty Veloso Garcia whose passion and love for Bohol knows no bounds. Let us prepare now for the next homecoming. Let us pray and hope we will not be missing anyone. We say this because we do not have the promise of our tomorrows. It is not often that the President of the Philippines can welcome arriving balikbayan or foreign guests at her official residence in Malacanang Palace, in the nation’s capital of Manila. Much more, it is not always that the Chief Executive, with all her workload schedules and numerous social functions to attend to, day by day, can still accept the invitation to be the Guest of Honor of a provincial homecoming celebration, to be held the week after. If the Presidential presence is the gage of success for a grand affair, then the thing speaks for itself, the twelve(12) day 2009 TBTK Global Homecoming scheduled from July 14-26, can be considered as one. For right on day one, our Boholano balikbayans and their foreign guests, after arrival from the Ninoy Aquino International Airport in Manila, have a scheduled audience on the afternoon of July 14, a Tuesday, with Her Excellency, Pres. Gloria Macapagal-Arroyo. The Boholano delegation will be led by Congressman Edgar Chatto, Bohol Gov. Erico Aumentado and the TBTK Chairperson Betty Veloso-Garcia. After which, they will be given a guided tour at Malacanang Palace, and to be served with cocktails at the Heroes Hall . As if given the privilege to meet the Head of State in person and being accorded all the VIP treatment, still not enough, President Arroyo will fly to Bohol the week after, to be with them for the Bohol Day celebration scheduled on July 22, a Wednesday, hosted by the Provincial Government of Bohol, headed by Governor Erico Aumentado. What more, her DENR Secretary Lito Atienza, will also be in Bohol on July 25, a Saturday, to lead a massive tree-planting drive province-wide in the morning, at the bank of Abatan River in Cortes town. In joint efforts of the Bohol Chamber of Commerce and the Provincial Government of Bohol. Just as the theme of the 4th TBTK staging is about Clean and Green Environment, Ecological Awareness, and the love of Mother Earth. Count our blessings and give thanks with a grateful heart, for President Arroyo has special affection to the people of Bohol. Not just for giving her the second highest votes during the 2003 election, but for being in the forefront of the national campaign for tourism promotions. Where the TBTK Global Homecoming, that started in 1999, was cited by the Department of Tourism as a model for other provinces to follow. Where Bohol now is considered as among the leading tourist destination sites in the Philippines. Bohol, according to statistical surveys conducted by the Philippine Overseas Employment Administration(POEA), also leads in the dollar remittances with an astounding figure of $57 million in 2008, from our Boholano Overseas Filipino Workers(OFW) and Overseas Contract Workers(OCW). Suffice it to say, the Boholanos are now respected in our country and admired in workplaces abroad. Our TBTK Chairperson, Mrs. Betty Veloso-Garcia and family, departed for Bohol yesterday, Wednesday, July 8, from the JFK International Airport in New York. She just came from Seattle, Washington, where Betty attended the Sleepless In Seattle Confederation of the Boholanos In the United States and Canada(CONBUSAC) Convention, headed by President Carlos Caga-anan. She also met Bohol Governor Erico Aumentado, CONBUSAC’s Guest of Honor. We beam with pride to hear that the TBTK Chairperson is awarded as one of the Ten Most Outstanding Overseas Boholanos by the CONBUSAC. Betty truly deserves such recognition. For all her efforts poured in the TBTK – for the cause of Bohol and the Boholanos. HOMECOMING Boholanos attending the biennial Tigum Bol-anon sa Tibuok Kalibutan (TBTK) are still urged to undergo self quarantine proceedings, in the absence of detection facilities here against the dreaded AH1N1 virus, says Provincial Administrator Tomas Abapo. In the same manner, locals who may be exposing themselves to the threat by mingling with homecoming relatives can just exercise the precautionary measures to keep them protected from the virus, according to Atty. Abapo. This week, Bohol has seen the onset of a homecoming crowd from abroad intending to participate in the worldwide gathering of Boholanos to pool investors for locally identified projects for private sector funding. Homing Boholanos from countries contaminated with the dreaded and highly contagious swine flu could indeed be bringing in the virus if they do not follow self-guarantine procedures as suggested by health authorities, a mediaman hinted. Stressing the self-quarantine as a national policy, which the Department of Health (DOH) has instructed, Abapo said it should be applicable to all persons coming from different places abroad and measures for locals. Atty Abapo, who spoke for Governor Erico Aumentado in his weekly the interaction with the media continued on by saying even President Macapagal-Arroyo set the example and has to go through the procedure. President Arroyo, who came from a marathon state visits in Japan, Brazil and Hongkong checked out at the Asian Hospital in Muntinlupa City recently without any signs that she was infected by A(H1N1) virus. While stating not much of local monitors at the ports of entry, Abapo said there is no way Bohol could put up the monitoring system like the thermal scanner which is only installed in the country’s major airports and ports of entry from abroad. Without the scanner to detect persons who may unwittingly carry the virus here, Abapo instead appealed for the honest observance of self precautionary measures suggested by the DOH as a way of keeping Bohol free from the virus. He talked about covering the mouth when coughing or sneezing, doing away from welcome hugs, constant and proper hand washing.